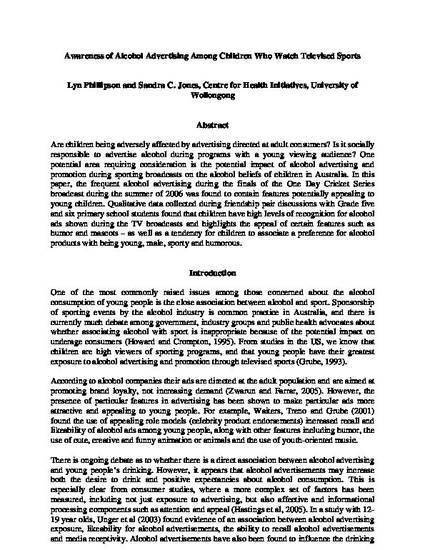 This conference paper was originally published as Phillipson, L and Jones, SC, Awareness of Alcohol Advertising Among Children Who Watch Televised Sports, Proceedings of the Australian and New Zealand Marketing Academy (ANZMAC) Conference, 2007, 2803-2810. Are children being adversely affected by advertising directed at adult consumers? Is it socially responsible to advertise alcohol during programs with a young viewing audience? One potential area requiring consideration is the potential impact of alcohol advertising and promotion during sporting broadcasts on the alcohol beliefs of children in Australia. In this paper, the frequent alcohol advertising during the finals of the One Day Cricket Series broadcast during the summer of 2006 was found to contain features potentially appealing to young children. Qualitative data collected during friendship pair discussions with Grade five and six primary school students found that children have high levels of recognition for alcohol ads shown during the TV broadcasts and highlights the appeal of certain features such as humor and mascots – as well as a tendency for children to associate a preference for alcohol products with being young, male, sporty and humorous.